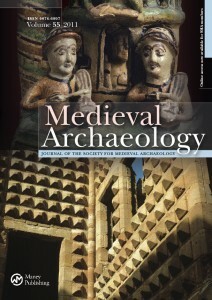 20 articles released for free to celebrate 60 years of the Society for Medieval Archaeology and its journal! To celebrate six decades of the journal, the current President, Carenza Lewis, the Honorary Secretary, Dawn Hadley, and the current Honorary Editor for the journal, Sarah Semple, have selected 20 articles published in the journal since 1957. These represent the journal’s strength in interdisciplinary scholarship and its role in bringing new findings to press as well as the continued emphasis on publishing major overviews of substantive original datasets. They also capture the shifting disciplinary and theoretical concerns of the subject, and the journal’s increasingly international remit. Many articles continue to be timely; precedents to, and relevant in, current debate. The selection inevitably excludes many excellent pieces, as the articles gathered here are chosen to provide an overview, and are not necessarily the most frequently cited. However we hope our selection provides a chance for our members to contemplate the changing profile of research published in the journal over 60 years. We hope you enjoy the compilation. Season’s Greetings from us all!